We Sell What We See: Make Your Own Brand Top of Mind! Something has been on my mind for a while, and I’ve waited to write it because I have no data for this theory that’s been formulating in my mind, and haven’t had time to research to see if there is corroborating data somewhere out there that I can give you. Here’s my theory: we sell what we see. First, a little background so you know where all this is coming from. 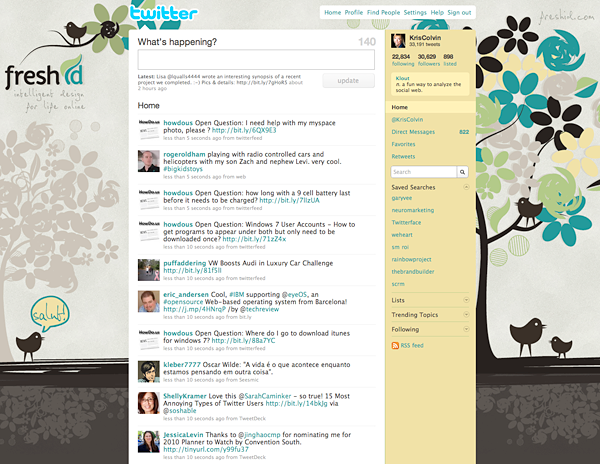 During 2009 I became involved in various business ventures… I launched Twitterface, my web-based Twitter client. I went away from a company name I had used for some years (this one, Fresh ID) and set up We Heart Studios with a lot of cute, focused names associated with it like We Heart Tumblr and We Heart WordPress. I created a long-needed “personal brand” for my pithy musings that have nothing to do with business. That brand got a lot of attention online for some reason, but it doesn’t really communicate what I do. I helped LightThread (who we partner with on lots of projects) as we tried to get more work here in the Kansas City area – in fact, we almost launched yet another new brand to focus on integrated marketing, then pulled back from that. All of these things have been competing for my attention. So coming into December, I had a lot on my mind… and I felt disconnected from my own company branding. I am a little mystified regarding the way people view me and how few people know what I actually do – I am mostly on “marketing” or “social media” lists on Twitter, which is so vague. That’s unsettling as someone who needs to make money from creative services, and mostly enables social media from a technology perspective, rather than being a speaker on it or author or something. In short, I felt I needed a brand overhaul and continuity, something I both relate to because it typifies me, and can use in a corporate setting to do what I do to earn a living. This can be hard for a creative type – we like so many things. But what I resonated with most is my old company name, Fresh ID… I have had a company with the name “Fresh” in the title since about 1997. After some thought I realized I needed to commit to it fully, with my whole being, and so I have finally made Fresh ID an LLC and am in the process of rebranding everything to fall in line with my core offering. What has this to do with you? Well, I want you to think about something. In the day-to-day, sort of always online life that many of us now lead – a true mix of business and pleasure at all times, what is it you’re looking at, physically? Are you looking at other people’s brands more than your own? This may seem unimportant, but consider for a minute: do you see branding for Twitter, Tweetdeck, Facebook, YouTube, Google, etc. more than yours? And if so, what are you focused on? Do you have a brand that represents you both online and in printed materials to give people? Whether you’re self-employed or work for a company, is that brand and all it stands for top-of-mind and in your face, every day? And if so, do you love it? Do you get the value behind the words and colors and images? Does it stand up well next to competitors? Is it vibrant and exciting to you, or stale and outdated, or non-existent? Are you proud of the brand you represent, so much so that it’s part of your life pretty much 24/7/365 days a year and you want to share it with people? Because my theory is, we sell people on what is most present in our lives. This is where I wish I had some numbers or studies to give you, but I don’t. All I have is my own semi-psychological nature and human factors observations to offer… really, just an intuition about this. I think that with my personal branding being most present for me, and my various other ventures being dabbled in and scattered around all over the internet, I was unfocused when it came to a unified message. So I have taken steps to bring my own brand into alignment with what I can do for people (intelligent design with a universal view), what I can offer (lots of creative/tech/socialization services) and what lights me up (making products.) And I’m really, really excited about it. I have some visuals of my new branding to show you, and will do a dissection in another post of how I created the Fresh ID brand and the various elements I used, for those who are interested and want to do something similar for themselves, or at least want to understand the visual dynamics of a strong brand. This site you’re in right now is the umbrella for all I will focus on in 2010. It’s not quite finished, so bear with me, but this is where my blog is now, and it has its own little name, The Arboretum. I like to think of The Arboretum as being where we can all hang out, discuss, think and learn from each other. I have moved my Design for Users blog into this site so that I can share all the thoughts I have on user experience and customer care, as well as point to the products we offer, show portfolio pieces, list services and explain our differentiator, since we are primarily a B2B services company. Twitterface is going through some changes and we will be changing its name eventually (partly due to Twitter’s request that product names not contain the word Twitter in them.) And of course I will continue to work on projects with my friends at LightThread. But this is going to help me focus on what’s truly important and enable me to keep my own brand top-of-mind in the coming year. This was my best decision so far, because bringing everything into this one business site is going to ensure I am in and out of my own company site much more than I was before. (I will keep my personal tumblr for playing, talking about cooking, music and other personal passions, etc.) We will be going further with this idea, as we develop ID Clouds (more on what that is later) that makes working online more pleasant and keeps us in our branded environment, because I truly believe we are selling what we see. What do you think? What are you looking at everyday? Is your focus as sharp and your mission on target? If not, let’s talk about it and get you on the right path. If you have a brand you love and are proud of, share it with us so we can learn from what you’re doing! I am so incredibly proud of you and what you are accomplishing with Fresh ID. 2010 is going to be a big, big, big year for you! I completely agree with your intuition and believe we do sell what we see. As human beings we have a finite capacity so we need to be selective with what we are looking at, thinking about and acting on as it all leads us to results…good ones or weak ones. You have presented a strong approach to developing a personal brand strategy that serves as an umbrella to all the various roles we play. Only after a strategy is developed can effective tactics be designed. I know first-hand Kris how 2009 led you down a variety of paths but given this new and improved strategy, I have no doubt you are in a much stronger place to make the tactical moves toward ultimate success! Great article and something for me to think about during 2010 also. My problem is that I need to finish my full web design and development website to help market my services, but I already have a full website that I don’t have enough time to stay up with on a day-to-day basis. I have been running DreamStation.cc (a video games news, reviews, and community website) since 1999. It is established and has a core group of members, but it doesn’t help me at all to market my web design and development business. When I spend time on it adding articles, upgrading it, and participating in the community I am ignoring getting my web design and development business website done. I wish I could use DreamStation.cc website and brand as my web design business, but it wouldn’t work, since it is all about video games. But, I am only one person and probably don’t have enough time to run two full-blown websites on top of doing client work. Similar to Fresh ID, the DreamStation.cc brand has been around for a long time and it represents me, but also represents video games and not web design. 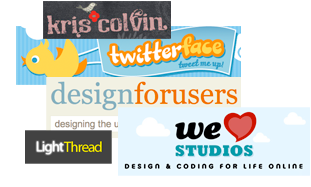 This is why I went with “cnc137 Design” for my web design and development business name. “cnc137” is my ID online and represents me, but I haven’t had time to get my full web design side of me online and organized and I am not sure if I will be able to stay up with both once I do. Lastly, I am still trying to figure out where Tumblr fits in all of this. I plan on having a blog on my web design website and I already use Twitter for quick posts. Where do Tumblr posts fit? Do they go between a blog and Twitter? 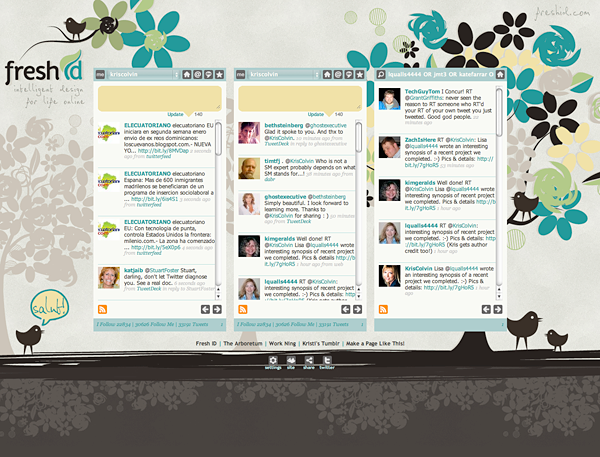 If you are spending time on those should you really be working on a full blog post or just tweeting the message? Any incite on how you use Tumblr would be helpful also. Take care and good luck with your 2010 adventures! I definitely hear you about the dilemma of doing client work vs. your own branding and marketing. I have been behind on some client things (fortunately they are small) while focusing on this. It’s hard to manage all that sometimes. What just came to me about your issue, is why not piggyback on the branding of Dreamstation and offer “Dreamstation services” and just add a page to your site? You could even parlay the ‘services’ side into being your Tumblr (sort of like I did with http://weheartstudios.com – I put the pages of info about services on the side, and use the blog part to share quick finds and write full posts related to web design – to me Tumblr is a blog so it’s great for both.) I don’t see a reason why you can’t marry the two somehow, and the concept of a “dream station” could grow larger as you also play with all of these social technologies in the coming years… just a thought and a way you might be able to address the issue of marketing yourself faster. The nice thing about using Tumblr for your company site, is you can easily talk about web design services AND also blog posts about video games, etc. that can then be reblogged among that crowd, so you’re indirectly getting the word out about all that you do. Do you see what I mean? Great post – part of the issue that I feel (and it sounds like you’re feeling as well) is despite (or maybe because of) the economy there are lots of interesting things going on. Partnerships, affiliations, interesting people to meet and collaborate with – and the pervasiveness of the internet and social media multiplies the potential to spread yourself thin. I think you’re on the right path – my blog post from last night covered a similar idea (http://www.aspirekc.com/Blog/2009/12/28/whats-the-solid-foundation-for-your-business/ ) You have to find and build on YOUR foundation of beliefs to really succeed in the long run. People want transparency and the want to know, like and trust you – and your brand / presence needs to reflect that. I love the ‘Fresh’ concept – great job and I look forward to seeing more. Thanks for the tips! I never thought about adding a “Services” page to DreamStation.cc. Maybe I need to look into that further and I will also check out Olivier’s site for some ideas. I original thought about calling my company “DreamStation.cc Design” or something like that, but didn’t want to confuse the video game side of things with the web design side. I have even thought about changing DreamStation.cc into a web design and video game website, since I am interested in both of those things, but that might alienate both groups or maybe I would gain new followers that like both??? I need to make my New Year’s resolution be to figure all of this out and either get my full site online for my web design business or merge the two into one company or site. Lots of things to think about in the new year and hopefully I have time to actually get them done. Chris, after spending the last few weeks getting all my ducks in a row, and branding things with the new Fresh ID brand, I heartily recommend you look at everything you do as one holistic picture. I can’t tell you how much I am enjoying hopping back and forth from my twitter, twitterface, ning, youtube channel, this blog and the freshid home page to do my work and interaction with people. It feels like I’m not scattered anymore. Though my personal tumblr is still sort of different and not connected to this site directly as much, it’s still easy to get to, feeds into my @kriscolvin twitter account and so it feels right to be more independent – it really is something that is a catchall for my personal tastes, finds and musings. I wish I’d figured all this out earlier, but the timing is right now so it’s all good. I’d take a piece of paper and a pencil and just sketch out all you do and all you need to communicate to folks. The DreamStation name is a great one that could mean lots of different things. I’d run with it, if I were you! I don’t think you’ll alienate followers if you keep things bucketed well, either – for example, our portfolio is under one section here, and the blog under another – it’s pretty easy to just stay in nothing but the blog if that’s why people are here, vs. getting lost elsewhere. I am going to point my old blog url (design-for-users.com) directly to freshid.com/blog soon, so old links on other sites/search engines won’t be broken.